This September we expanded our GP Aware campaign to the North West and the South West of the UK. This development comes after research showed a higher number of pancreatic cancer instances together with survey results highlighting low awareness of the disease in these areas. Pancreatic cancer, the UK’s 5th biggest cancer killer, is becoming an increasingly urgent problem in the UK. By 2025 deaths from pancreatic cancer are predicted to be 25% higher than breast cancer in the EU. Here at Pancreatic Cancer Action (PCA) our primary objective is to improve early diagnosis of the disease with the aim of increasing survival and quality of life for patients. One of our key activities is the provision of resources for medical professionals; to update them on the latest developments such as diagnostic and treatment guidelines, epidemiological data and other risk factors that can help them diagnose pancreatic cancer earlier. PCA is a global pioneer in this field. 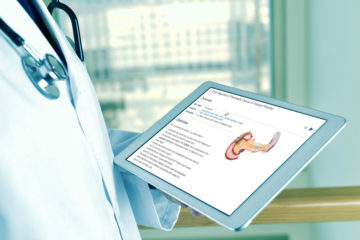 We are the very first in the world to have developed an e-learning module for pancreatic cancer in 2012 for GPs and hospital doctors and last year we piloted the first ever targeted awareness programme for GPs: GP Aware. And, while we do fund research specifically into finding ways to improve early diagnosis, what we may learn from those and other studies that look promising could take 10 to 15 years to reach the clinical environment and even longer to benefit patients. So, we have to do something now using today’s knowledge and technologies. We have all heard anecdotally that many pancreatic cancer symptoms can be dismissed by both GPs and patients as not being related to the disease – it happened to me in 2007. Which is why I personally have made it a mission to improve GP and public knowledge and awareness so that symptoms are not dismissed, and people are referred earlier. But we also have evidence from the NCIN Routes to Diagnosis study that when people are referred by a GP, their 1 year survival rate is 31% versus 12% when people present as an emergency in A&E. So we need to have more GPs referring patients sooner. So, in 2017 we piloted our GP Aware programme with leaflet displays and advertising in GP surgeries in Glasgow and Surrey which proved hugely successful. In addition to the leaflet and poster campaign, a section of our website was developed for medical professionals. We also distributed Health Care Information Packs, which contained symptoms information, NICE referral guidelines, facts and statistics, and key messages about pancreatic cancer, as well as merchandise including flag pens (with the symptoms on). In addition, we asked professionals to provide feedback about the materials. Among mostly positive feedback, a GP in Glasgow said: “I had a few patients that presented with possible symptoms that I checked out due to this campaign.” This is definitely what we wanted to hear! Following on from this success, we have rolled out the GP Aware programme to two other regions in the UK this summer; The North West and South West. 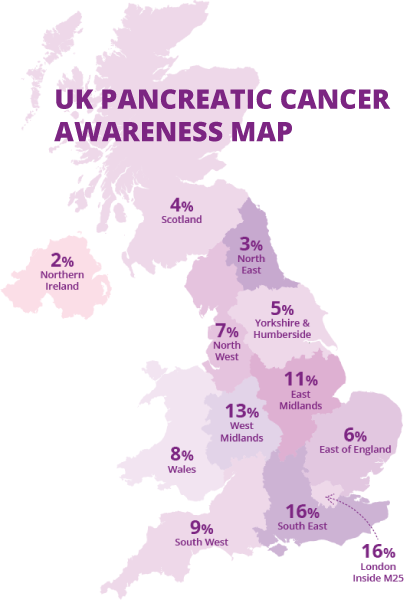 These areas have been strategically targeted due to relatively high incidence of pancreatic cancer and, according to a 2017 public awareness survey, they are areas of the UK with some of the lowest rates of awareness of the symptoms of the disease. We are planning on extending GP Aware to other parts of the UK including Northern Ireland in 2019 and will be looking to combine this with both a public awareness campaign and one for pharmacists.